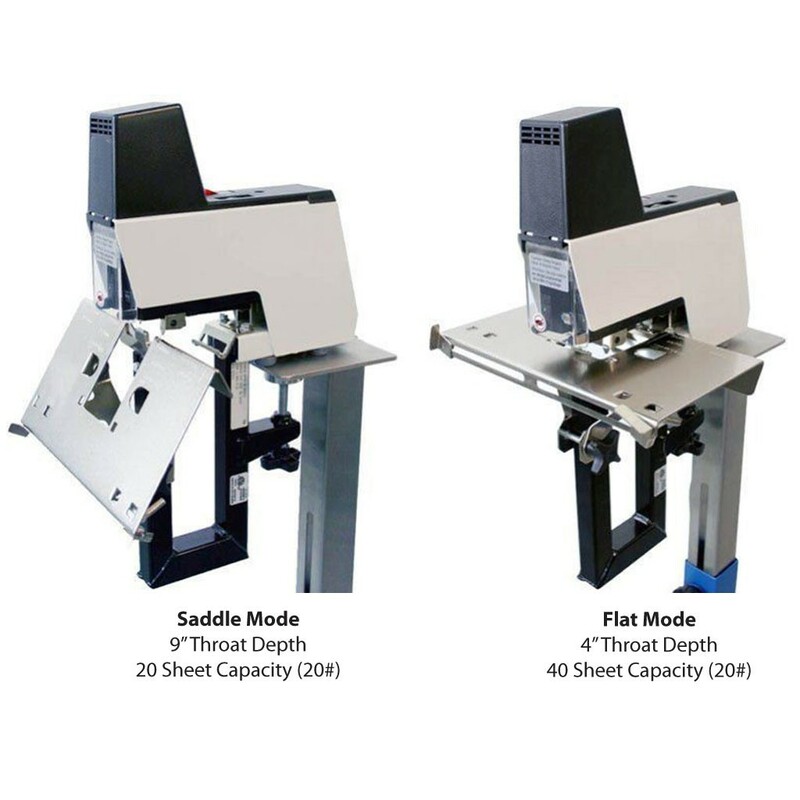 Looking for a saddle stapler what will speed up production and efficiency? The Rapid 106 might be right for you. This saddle stapler switches from flat to saddle mode with just a few simple steps, giving you the versatility you demand. It has a of up to 40 sheets of 20 pound paper in flat mode, or up to 20 sheets of 20 pound paper in saddle mode. Adjustable power control allows you to determine the precise impact setting for your specific job while the dual adjustable touch trips enable exact staple placement, for a perfect bind every time. The Rapid 106 Stapler features a hinged safety shield that automatically shuts the power off when lifted to avoid accidents and protect the operator. The R106 Electric Stapler features a thin design and optional narrow table that allow for stapling of very narrow items. A detachable foot pedal is included to allow for two free hands during operation. It can staple up to four inches deep in flat mode, or nine inches deep in saddle mode, allowing for sheets as large as eighteen inches to be saddle stapled into booklets. We are so confident in the durability and reliability of the Rapid 106 Stapler, that it comes standard with a one year manufacturer’s warranty. Measuring only 12” D x 10” W x 17.25” H, the Rapid 106 can fit on any work table for convenient stapling. Weighing at only eleven pounds, it can be easily transported to different working locations when necessary. We even have a video to show you how the stapler works. The Rapid 106 Electric Saddle Stapler is the first and only "gangable" combination stapler to be introduced to the printing industry. The "gangster" option allows multiple stapling heads to be linked with fiber-optic cables, offering multi-head stapling to speed up production even more! No more double or triple stapling using just one stapler, you can simultaneously staple up to two staples on one sheet with each Group Stapling Kit. Designed specifically for the Rapid 106 Electric Stapler, the W106-K Group Stapling Kit allows two or more staplers to operate simultaneously with one foot pedal. This application is for saddle stapling only. The staple distance ranges from 2 ½" up to 15" center to center. One kit is required for every two staplers. 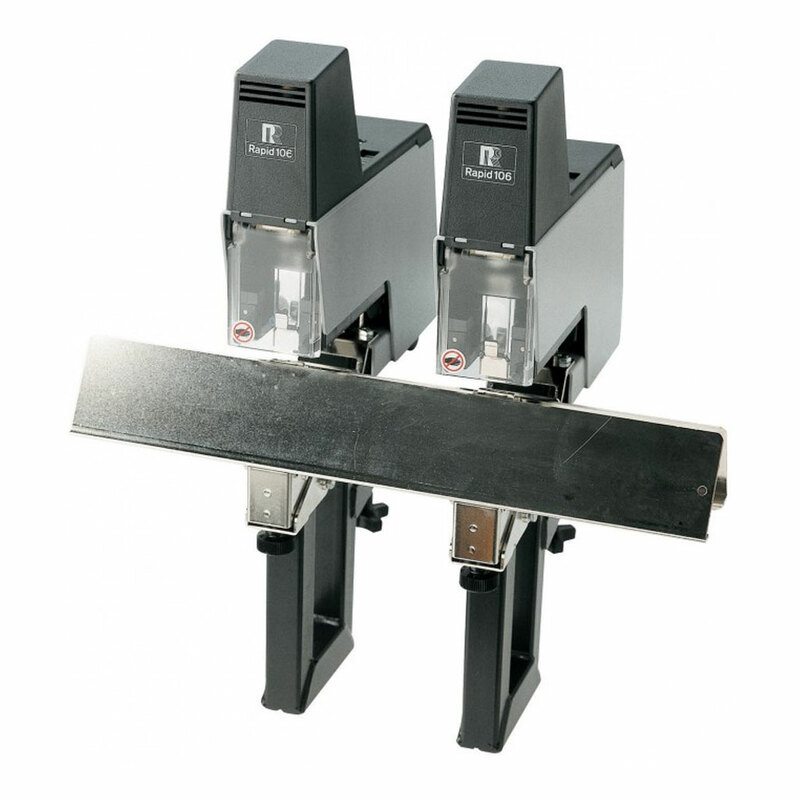 The Group Stapling Kit includes one saddle runner with two brackets, one optic cable and two small anvils. The Rapid 106 Electric Saddle Stapler offers the versatility of two staplers in one (flat and saddle) and even offers the opportunity to simultaneously use up to two staplers at a time per group stapling kit. Do even more by purchasing multiple kits. The Rapid 106 Electric Stapler will speed up production, save you money, and make saddle stapling easier with its easy-to-use instructions.